It was only just over 30 years ago that the television, that stood alone in the corner of the room without any additional adornments other than the aerial sticking out, had three channels. In those halcyon days of a handful of channels of terrestrial TV we had one remote to argue over and if we wanted to know what was on we flicked through the channels or read a listings magazine or the TV guide in the local newspaper. In those days this was state-of-the-art technology. Never at that time could we have imagined digital TV, the web and multiple connected devices. It seems incredible to think that in such a short space of time our viewing habits have changed beyond recognition. Now we're spoilt with hundreds of channels that we can watch any time we like: in the traditional real-time sense, on demand, or using time shift. And we can consume content wherever we like: on the TV, PC, tablet or smartphone. This is all fantastic news, but with all this content available 24/7 how do we find the programmes that we want to watch now? These days instead of flicking through the channels we've become heavily reliant on the EPG. It shows us what's on and when, acts as the GUI to record programmes and crucially provides additional information that may or may not tempt us to watch. 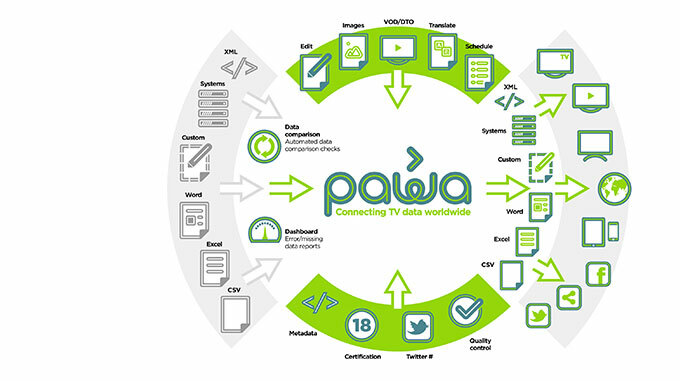 Not only has the EPG become an integral part of our viewing habits it's also a key sales tool for broadcasters. With so many channels fighting for audience share the way that the content is written and presented is vital. So how does the EPG work? Let's take a small national channel as an example. The channel will schedule its shows each day (probably using Excel or a scheduling system). This information is then fed to the playout system, which in turn provides the video feed to the platform hosting the channel. This takes care of the video but what about the data for those scheduled programmes? Most platforms require the data to be supplied separately, in this instance, the schedule information (Excel spreadsheet) is sent to an EPG provider where it is imported into an EPG database, along with additional metadata such as series links, images and cast etc. With many of these channels broadcasting across multiple platforms and multiple territories, which all require different specifications, not just for file formats but for character length, additional data fields and flags etc., we can see that this is not a straightforward process. Knowing how important the EPG is in providing a hook from channel-to-viewer means that the job of the editor in creating that eye-catching copy, which sets channels apart from the crowd, is highly skilled. Then comes translation, highlights creation, press document production for print and online publication and so on. As well as enabling us to discover content listed on the EPG, the data provided by the channel to the platform also has important technical implications. Again if you cast your mind back it's not that long ago that we were recording on VHS, which was often hit and miss! If you set up a programme to record at 6pm you taped whatever was showing at that time regardless of time changes and overruns. With the advent of digital TV thankfully things have moved on and it's the EPG data that provides a vital role in ensuring that the record and series linking functionality works correctly. Now to enable us to record, every programme has an event ID logged within the EPG, so that five minutes before the programme starts and five minutes after it has finished, the set-top box will record against that specific event. This means that if the programme is delayed or moved, providing the EPG is modified accordingly, the set-top box will still make the recording ensuring that all those shows that you recorded in the week are linked and ready to watch when you are. Taking that a step further, as well as recording and linking programmes, the EPG has an important role to play when it comes to conditional access and encryption. There's a whole variety of content delivered to our TV screens and second-screen devices; some is free-to-air and some is encrypted. Like the series link functionality, the set-top box, which is decoding the broadcast stream, has to be told when to start and stop the encryption. This has a number of implications. Firstly there's the financial aspect because the channel doesn't want to lose revenue if material is aired for free by mistake. But perhaps more important is the regulatory implication: channels have to adhere to very strict broadcasting guidelines. The triggering of these actions on the set-top box is all driven by the EPG data. It's the responsibility of channels to provide this information to platforms, which are heavily reliant on the data being accurate to satisfy viewers and to provide a competitive advantage. Quite simply without the EPG there is no content discovery and without content discovery there are no programmes.